News The Colbert Report Is Dead. Long Live Stephen Colbert! News Will Colbert's truthiness survive the 'Late Show' switch? A new film from award-winning filmmaker Ken Burns, tells the story of a tiny school in Putney, Vermont, the Greenwood School, where each year the students are encouraged to memorize, practice and recite the Gettysburg Address. 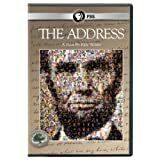 In its exploration of the Greenwood School, the film also unlocks the history, context and importance of President Lincoln's most powerful address. News Betty White's Madame Tussauds Wax Figure Temporarily Moves to Washington, D.C. The all-star cast includes Craig Bierko, Stephen Colbert, Jon Cryer, Katie Finneran, Neil Patrick Harris, Christina Hendricks, Aaron Lazar, Patti LuPone, Jill Paice, Martha Plimpton, Anika Noni Rose, Jennifer Laura Thompson, Jim Walton and Chryssie Whitehead. Lonny Price directed the production with Paul Gemignani conducting the New York Philharmonic.